New tips and reviews every week. If you're looking for innovative theatre, you've come to the right place. Every week, Lyn will be sharing her recommendations on the Stagedoor app. Sometimes these will feature shows on the West End. Sometimes they’ll be on the Fringe. They’ll always be exciting. 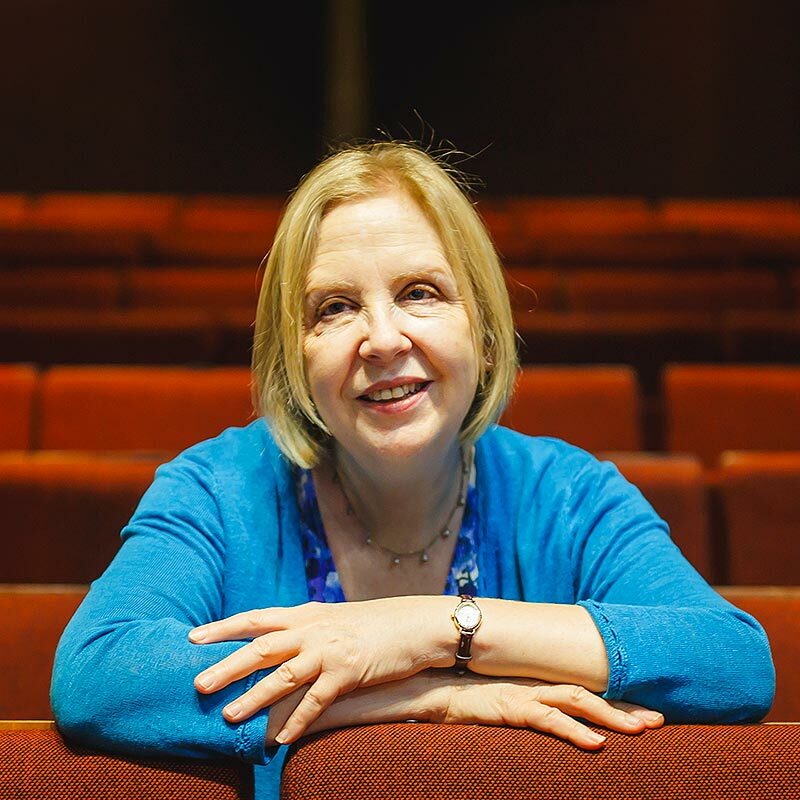 Lyn’s recommendations will be joined by longer, thematic articles commenting on the latest trends in how theatre is being made – and what we’re making theatre about. Follow Lyn on the Stagedoor app. It’s clear right from the start of Jeremy Herrin’s revival of All My Sons that this is an America in denial. Promising Scottish playwright Libby (Neve McIntosh) moved to London. But now Libby is in her forties, her once auspicious career is on the rocks and she’s back in Edinburgh standing on Salisbury Crags thinking of stepping out into the void. In Shakespeare’s Hamlet we last see the doomed Ophelia handing out flowers. These flowers have meaning. Rosemary is for remembrance. Pansies are for thoughts. Rebecca Frecknall’s staging of Three Sisters at the Almeida begins a year before Chekhov’s play normally begins. It opens with the funeral of the siblings’ father, the late General, who brought them to the provincial Russian garrison town where they are now stranded far from their beloved Moscow. Some of my best friends think theatre is boring. There are plenty of nights in the theatre when I think they might have a point. Then I see something brilliant and I fall in love with theatre all over again and leave the theatre giddy with excitement. There is a bit of a VAULT Festival takeover on the London fringe at the moment. Richard Eyre has talked about the way that theatre creates empathy, arguing that the arts "enable us to put ourselves in the minds, eyes, ears and hearts of other human beings." Bruce Norris' latest play, Downstate, is an exercise in empathy, a test of our humanity. Naked lightbulbs glow in the haze hanging over the stage in Battersea Arts Centre’s Grand Hall. From out of the shadows emerge sounds like the rumbling of thunder or the rustle of leaves or the coo of doves. Voices soar in lament, tongues click, and the stage shimmers with sound and emotion. So, to which Betrayal exactly does the title refer? There are many different kinds of betrayal in Harold Pinter’s 1978 play inspired by his own adulterous relationship with Joan Bakewell. Like last year’s Edinburgh fringe, one of the things that the 2019 Vault Festival has proved is that, while more established theatres are still struggling to tell different and more diverse stories, those at the beginning of their careers are making it look as easy as drinking a glass of water. Shows can look and feel very different depending on the seat from which you experience them. In 'Dangerous Giant Animals' Christina Murdoch plays Claire, the middle and often overlooked sister in an American family. If you were Nicholas Hytner and over a 40-year career you had never directed a play by a woman Alys, Always seems a curious place to start. Most of us think that we are experts on what it’s like to be in prison on the basis of having seen a few episodes of Orange is the New Black or Locked Up. The maid in the hotel room is up to her elbows in blood. There is a dead body on the floor and a congealing rust-like puddle spreads out from beneath it. There follows a breathless story from the maid about how the hotel guest attacked her and how she killed in self-defence. Kandinsky’s Dinomania takes place in a theatre—the New Diorama—but in Joshua Gadsby and Naomi Kuyck-Cohen’s design it also looks as if it might be taking place in a particularly tasteful funeral parlour complete with a pianist (Zac Gvirtzman) performing throughout. Jon Ronson’s 'So, You’ve Been Publicly Shamed' has inspired Molly Taylor’s 'Cacophony', produced by the Almeida Young Company, and which is at the Yard until Saturday. VAULT Reviews: Call Me Fury & Bottled. There is a power in naming. In Salem during its 17th century witch trials the accused were urged to name others who were also witches. In times of fear naming can be a kind of contagion. Holly Robinson’s play is a debut and it is always thrilling to hear a distinctive new voice and see a first play of such startling assurance. There are lots of smart shows at the Vault Festival but the conditions seldom lend themselves to work which is also slick. But Saturday night’s viewings brought forward two very neatly put together shows that both know exactly what they are doing and are both smart and slick. “Piece out our imperfections with your thoughts,” says the Chorus at the start of Henry V, adding, “Think when we talk of horses, that you see them/ Printing their proud hoofs i' the receiving earth. Most protest takes the form of theatre, a spectacle that disrupts the status quo. Inspired by their personal experiences of manning the barricades in Kiev's 2014 uprising, Mark and Marichka Marczyk's folk opera harnesses that idea. When 15-year-old Cork resident, Naoise, wins the Under -16s European kick boxing championships her future seems assured. When the boy was a child his father used to tell him stories of the Apollo moon landings and how the stars were in reach for all of us. The boy wanted to grow up to be an astronaut but now he is a man—nameless and just a statistic like so many of the homeless. Christopher Adams and Timothy Allsop are a couple in real-life. They say that they don’t work together because Orton and Halliwell were not the best role models. But in Open they are not just appearing together on stage they are excavating their own life as a couple. The VAULT Festival is effectively Edinburgh in London with about the same level of dampness and similar spiralling levels of excitement. It makes theatre an event. It makes it fun. A woman dressed like Princess Diana on her wedding day sits at a table covered in a Union Jack and eats. The 20th century musical is one of the most under-rated art forms, as if its commercial successes and the fact that audiences love it inevitably means that it's artistic creditability is sapped. I've always thought it was odd that The Pleasance is such a major player in Edinburgh every fringe, but that its London venue never feels like a significant pin on the theatrical map. Continuing from last week’s article, here’s my guide to VAULT Festival from weeks 2 to 5. This is a mix of shows I've seen before and enjoyed – and new shows that have caught my eye. “The past is a foreign country: they do things differently there,” begins LP Hartley’s 1953 novel, The Go Between. But as Hartley’s anti-hero discovers we carry the past with us. There is no escaping it. That Anthony Neilson is a sly one. Smart too. His latest piece, the Tell-Tale Heart at the National Theatre’s Dorfman space, takes Edgar Allan Poe’s creepy 1843 story of madness and murder and gives it a contemporary spin. London is bursting to the brim with theatre from the West End to the NT on the South Bank to the boutique venues such as the Donmar to the Almeida. I came late to The Inheritance at the Duke of York’s, only catching up with it on World Aids Day. Ellie Kendrick’s Hole at the Royal Court Upstairs operates like an all- female cosmic cabaret, and one whose rocket fuel is rage. History is too serious to be left to the historians. Particularly personal histories. But it is these individual stories, the ones that never make it to the history books, which shed the greatest light. Yet so often they remain hidden from view. The National has always had better luck with musicals the more off-beat they have been. The Doomsday Clock stands at two minutes to midnight. Scientists have warned that we have 12 years to avert climate change disaster. But still we sleepwalk towards catastrophe, taking no responsibility. We assume, like children, that the grown-ups—the scientists and the policy-makers—will save us. Nobody would dispute that it is an honour to be the theatre culture that produced the playwright who many agree is the greatest that the world has ever seen. But it can also be a bit of a burden.